Make employee scheduling easier! We provide a self-implemented system that is easy to learn using conveniences like streamlined onboarding, intuitive interface and free mobile apps. 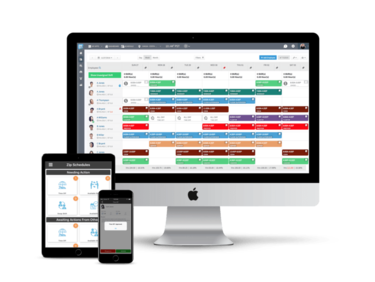 Our employee scheduling software is designed to make life easier for your business while saving you time and money. 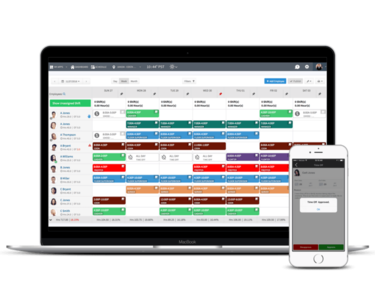 Zip Schedules is a streamlined employee scheduling software that can integrate with any business. Find out how easy it is to save hours every week by creating work schedules that engage employees through our scheduling software. Start Your Free Trial Today. Join Thousands of Happy Customers Who Use Zip Schedules to Enhance Their Business. Struggling to get the word out to every employee? Getting the word out to employees for a big event or policy change is more difficult than you’d think. It requires persistence and time that our Managers don’t often have. Right now we use email, but not everyone checks theirs on a regular basis and calling each employee takes way to long. When you factor in the way our managers handle requests (they sometimes forget) such as time off, availability changes and shift swaps by writing down reminders on sticky notes. It goes to show how the lack of a suitable internal communication process can affect your business. The Zip Schedules free mobile app and internal messaging platform helps you overcome all of your communication challenges. For big events or policy changes, managers can send out blasts through our internal messaging system that gets received through the mobile app and email depending on the employee’s communication settings. We’ve also made it effortless for managers to handle requests. 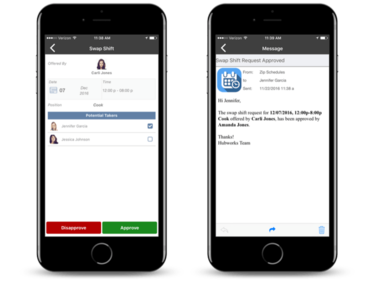 Employees can make any scheduling request right from the mobile app and the manager is instantly notified to approve or reject it. Tired of employee schedule execuses and complaints? Employees are always complaining that they don’t know their work schedule and that requesting time off, a change in availability or a swap-shift is annoying because its time consuming and not as easy as it could be. They want to know the status of their request sooner rather than later because it helps them plan around their shift schedule. 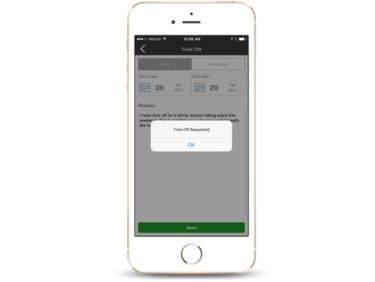 With Zip Schedules, employees have the option to download our free mobile app to ensure they are always connected while having the ability to receive news/blasts and instantly make requests such as time off, availability changes and swap shifts. Managers can immediately respond with one click, so nobody has to wait. Having a hard time filling dropped shifts? Employees like to complain about their schedule and tend to have negative feelings towards it when it doesn't fit their needs. This results in dropped shifts that are often hard to fill at the last minute. You could end up short-staffed for the shift which hurts your customer experience. This frustrating experience can be avoided with the right scheduling tools. By giving employees mobile access to their schedule with the additional ability to make requests and manage shifts, your employees will feel more empowered over their schedule and be more likely to swap shifts in advance, so you don't get left hanging. But, if an employee does drop a shift at the last second we've made it easy to quickly offer it up to any qualified employee with one click. Do your employees always show up for scheduled shifts? When employees trade shifts and make requests, they are often hard to stay on top of. Once an employee places a request, they assume it’s taken care of and they are no longer responsible. This puts you in such a bind with shifts being left open and nobody to pick them up. And, employees believe that have a legitimate excuse not to show up. Zip Schedules helps eliminate any confusion if an employee calls in sick or can’t make their shift. They can either offer it to all employees or as a manager; you can offer or re-assign it to a different employee ahead of time or at the last second. While doing this, you know all of the involved parties know of the shift status and any changes. Our support team is only a phone call away. We want you to be successful in seeing the value online schedule maker software can have on your employee scheduling, so we help you whenever you need it. Access work schedules and employee requests on any desktop, tablet or mobile device. Rest assured consistent customer experience is delivered by putting standard operating procedures in the hands of your staff at all times. Do you have special hours and schedules for different holidays throughout the year? Our schedule maker lets you save your favorite templates than can be used anytime. You can also copy any work schedule from week-to-week. Hold managers accountable for the cost of labor. Daily and weekly budget goals display as a guide on the schedule along with fixed position time allowances making it easy to avoid over or underscheduling employees. Quickly import your employees from an excel list to start scheduling immediately. Later adjustments can be made to employee availability, their ratings at each position, and notes to identify over or underachieving employees. With Zip Forecast, our sales and labor forecasting engine, you have the ability to predict your business based on the sales and transaction volumes to better schedule employees and reduce labor costs up to 2%.